Would your husband fancy a going on the longest zip line in the UAE? If you’re looking for a gift that’s a bit out of ordinary, then we might just have the thing for you! Men can be tricky to buy for at the best of times but this Christmas we’ve found the perfect present to impress your thrill seeking husband! Here, Jemma gives you the low down on Via Ferrata, the newest and longest zip line in the UAE. “It was my Husband’s 40th birthday this week and I was really stuck for ideas of what to get him. I wanted to do something that was a little bit different; something that would connect him with nature and would be creating a memory for his special day. I stumbled upon the perfect hidden gem and it didn’t break the back either! The Via Ferrata, the UAE’s longest zip line, has just opened a short drive away in Ras Al Khaimah. 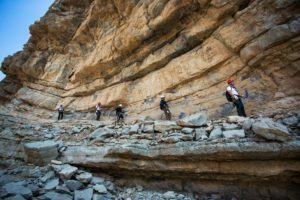 It spans the rocky facades of Jebel Jais mountain, which rises to 1,934 meters tall and is part of the rugged and spectacular Al Hajar mountain range that runs from the UAE to Oman. Meaning ‘iron road’ in Italian; Via Ferrata is a 470-meter-long mountain route that’s equipped with fixed ladders and cables, on which a harnessed high rope pathway runs close to the mountain edge. It’s a cross between rock climbing and mountaineering and comprises of three individual start and finish points, as well as three zip-lines measuring 50m, 60m and 300m long. Via Ferrata has been created to appeal to a wide range of ages and abilities (age 12-65) making it perfect for teenagers too. All that’s required is that the person taking part has a moderate fitness level and must be comfortable at heights. No prior experience is needed as the operator will ensure that everyone gains the skills to successfully complete the course. I booked my husband on the first ever group for the public, led by experienced instructor and fellow Brit Andy of Absolute Adventure. The group consisted of eight people and four instructors who gave a really thorough safety demonstration. The whole course takes around 4 hours to complete and you have the choice of booking the 9am or 1pm start. Choosing the 9am time meant that our meeting time was 8am at Manar Mall in RAK. It took us 1 hour and 15 mins to get there from Dubai and it’s virtually straight all the way down the E311 and really easy to find. A white minibus was at the mall waiting with a Jebel Jais sign on. I followed the minibus in my car for a further drive of 25 minutes to the foot of Jebel Jais. There’s a security guard there in the Wadi who stops every car from entering the area, (as it’s private property.) Taking my car there was not encouraged by the tour organisers but I didn’t experience any problems parking it and going off to explore the terrain with my children whilst my husband began his adventure! The Via Ferrata standard (and easiest) course, called the Ledge Walk, was the one that I booked. It starts with a gentle climb through rocks, going into a vertical stretch that leads to the 50m zip-line. A gradual slope then leads to the 60m zip-line before another path leads to 300m zip-line for the journey back to the middle section. From there, the return back to the wadi is 225 meters long. 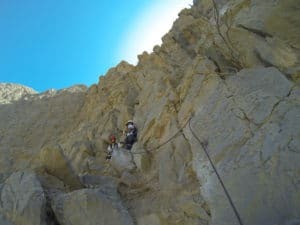 This adventure gives any outdoorsy type a chance to reach the same high, vertical faces as rock climbers would without the same strenuous training because of the metal-ladder rungs fixed into the rocks and the cable to which you are secured. My husband loved this experience, (and thoroughly recommends it) but when he was told the exciting news that Jebel Jais will soon host the longest zip line in the world (a staggering 2.6km long thrill ride, that can hurtle you through the air at up to 120 kmph) he was already booking this next adventure in his head! 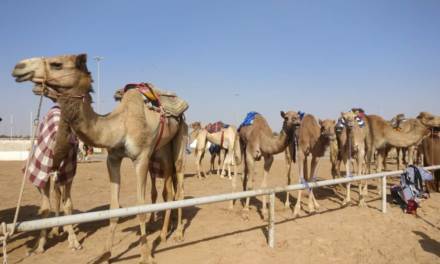 This is all part of a huge push to make the northern Emirate a hub for thrill seekers and adventurers. Ras Al Khaimah’s natural mountain beauty is really breathtaking. It made such a difference to escape the buzz of Dubai and whilst we were there, we found ourselves pondering why we’re not doing things like this more often. The children enjoyed the cooler morning (up to 10 degrees lower temperatures than Dubai), the rough terrain, the mountain goats and the simple joys of picnicking under a tree. What’s more, visitors will soon be able to enjoy the scenery from observation decks that are being planned for the Jebel Jais peak. You’ll be provided with all safety equipment, a small backpack and extra space for your personal items. Take plenty of water with you as it can be thirsty work climbing those heights! 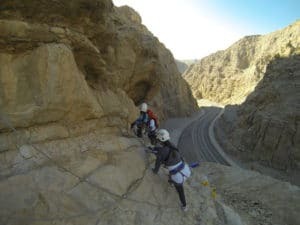 Bookings for the Via Ferrata challenge can be made via www.jebeljais.ae and the cost is 400 AED making it great value as a special gift… You never know, you might just be up for doing it as well! NextWIN A FAMILY TICKET TO SEE PETER PAN @ DUCTAC! 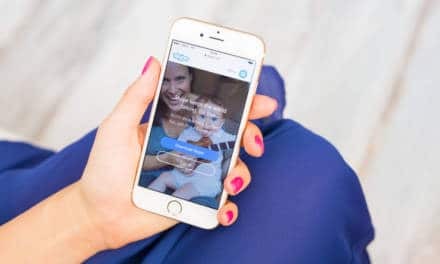 DO YOU MISS BEING WITH YOUR FAMILY IN THE U.K? IF SO, A BRILLIANT BBC TV SHOW NEEDS YOU! 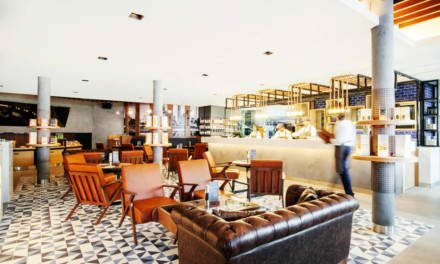 FAB News – Jones the Grocer has just opened at Emirates Golf Club!